Wanted to update my mom's old 70's back splash. Went to Lowe's to look for tile and found a great mosaic ~ only problem was I had never tiled before. 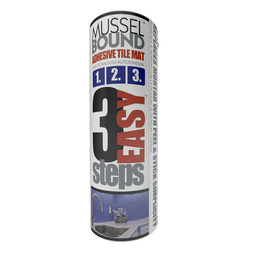 Sales guy told me about Musselbound because it would be easier, save steps of figuring out mortar, and I wouldn't have to take down the old laminate back splash. It was so easy to work with and by choosing a mosaic with a mesh on the back, I could cut most everything with scissors or a utility knife. Someone who has tiled before could have probably done it in one day, ~ took me two. Could grout as soon as tile was up. Great stuff! 55of 66voted this as helpful. burdock has not submitted any questions. burdock has not submitted any answers. burdock has not submitted any stories.